These 1" Custom Large Novelty Dice feature your full color logo and designs printed on one to six sides of the Dice. 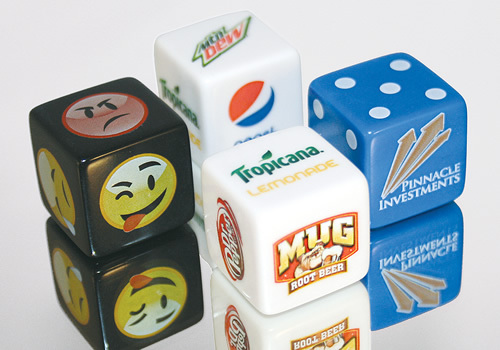 1" Customized Dice are perfect for tradeshows, incentive programs, giveaways, and much more. Custom Game Board Dice measure 5/8" and Casino Dice are 3/4", so 1" Custom Dice will give your promotional message a "super-sized" impact! Additionally, because our 1" Custom Dice offer a large imprint area, we recommend these Branded Dice if you have a detail-rich or wide logo, or you are looking to print different words/phrases on each side of your Promotional Dice. Made of durable plastic, our 1" Custom Printed Dice are available in Black, Blue, Green, Red, and White. The minimum order for our Large Promotional Dice is 500 pieces (250 pair). Please note: For Large, Transparent Customized Dice, please see our 1" Custom Transparent Dice.